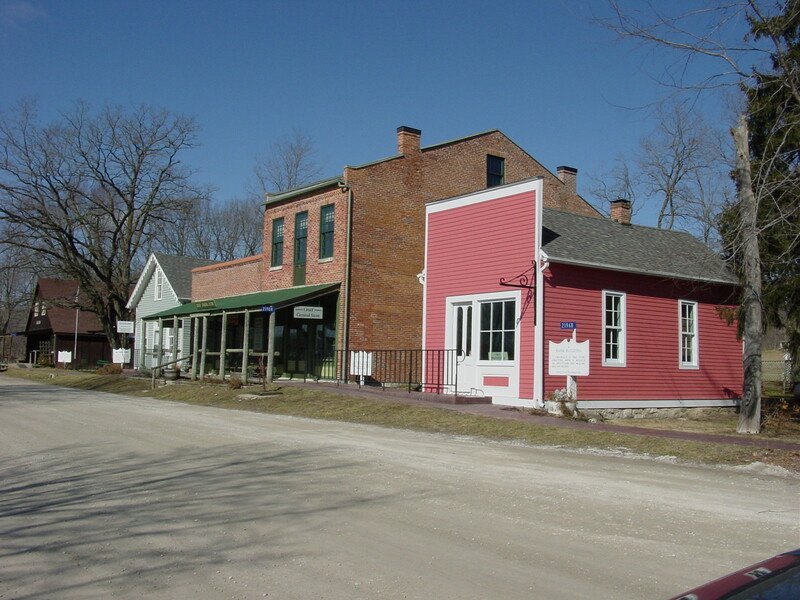 Historic village of Bentonsport, Iowa. Photo by Kenneth Mays. 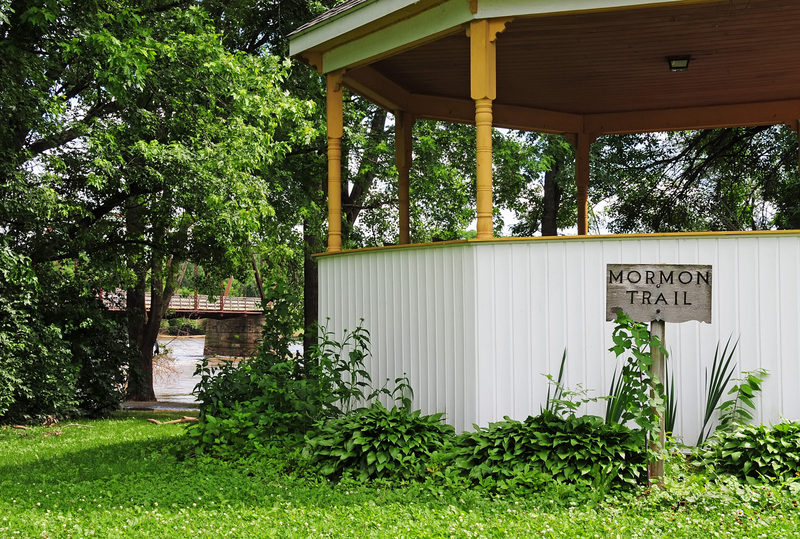 About thirty miles west of Fort Madison, IA on Iowa’s Mormon Pioneer Trail is the small village of Bentonsport. 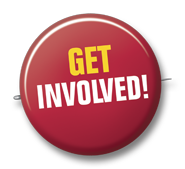 It is situated on the north bank of the Des Moines River in Van Buren County four miles northwest of Bonaparte. 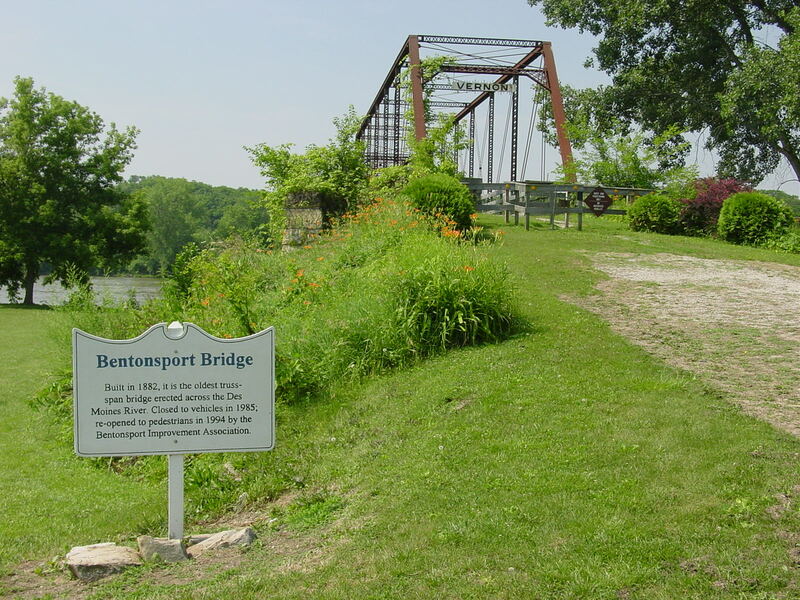 Bentonsport was once an important port-of-call for Des Moines River steamers. 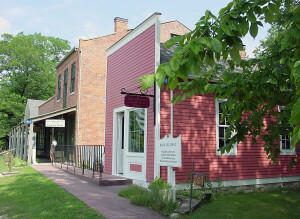 In 1836 the site was established as a trading post operated by Charles Sanford. Originally known as the Ross Settlement, the name was later changed to Benton’s Port, in honor of Senator Thomas Hart Benton of Missouri. Gazebo at Bentonsport, Iowa with sign noting the Mormon Trail. Photo by Kenneth Mays. By the time the Mormon pioneers came through Bentonsport, several flour and saw mills had been constructed and were in use. A number of Latter-day Saints found employment there. Being a river town, Bentonsport has had its share of serious flooding. Two of the worst were 1851 and 1903. Presently, Bentonsport has a riverside village of little shops, an Indian artifact museum, historic bridge, perennial garden, and festivals. 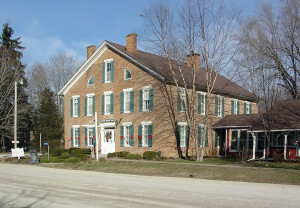 Mason House Inn at Bentonsport, IA. Photo by Kenneth Mays. 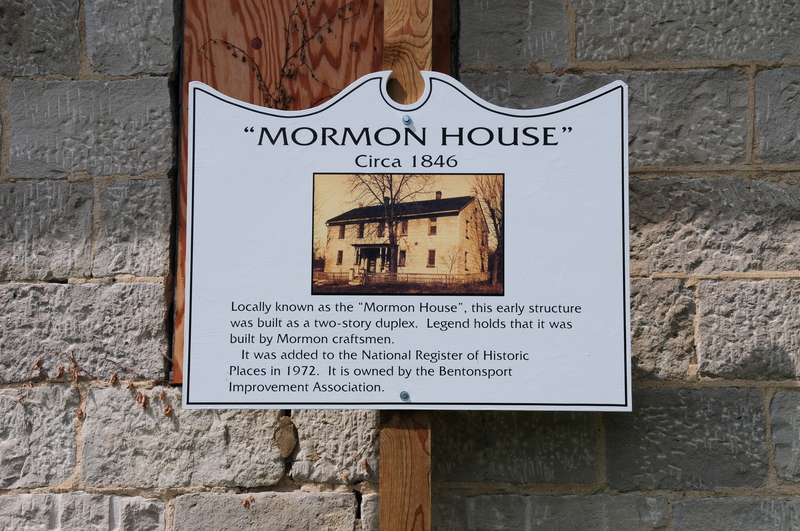 There are several extant buildings of interest to students of Latter-day Saint history at Bentonsport. 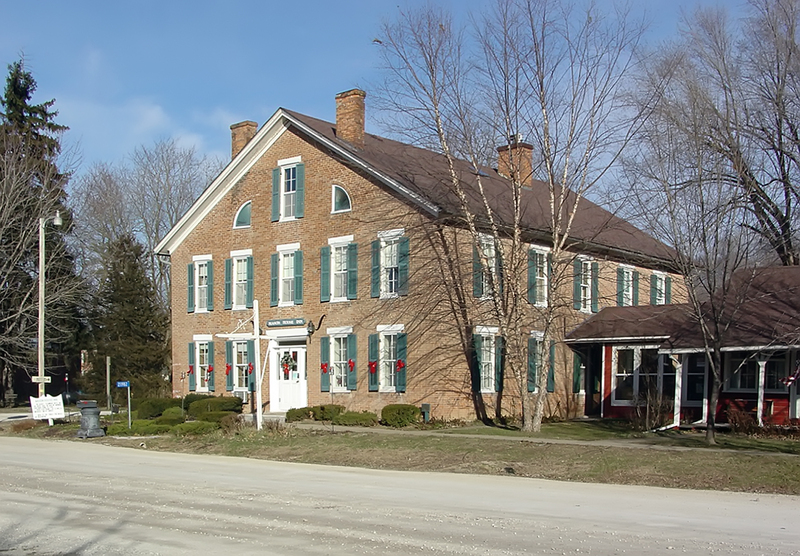 The first is the Mason House Inn. Sign noting that the Mason House Inn at Bentonsport was built by Mormons heading west. Photo by Kenneth Mays. 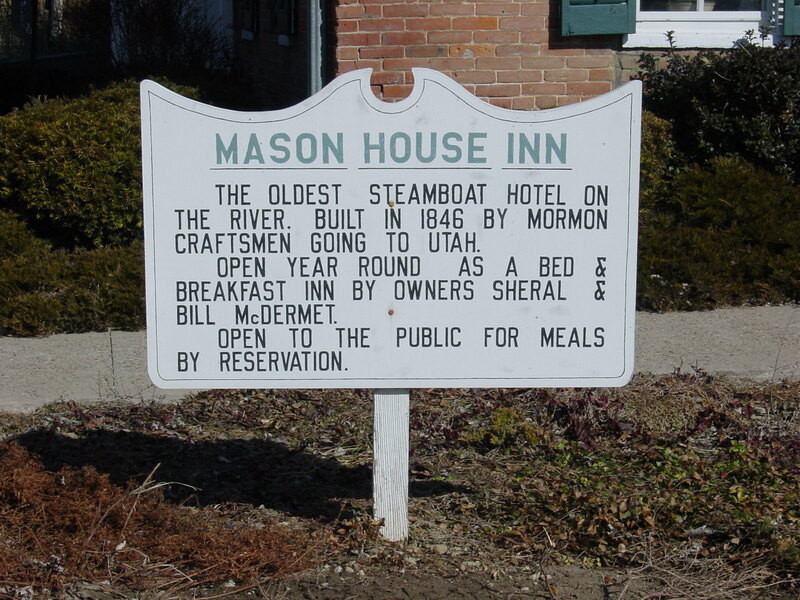 A small sign in front notes that this structure was built by “Mormon craftsmen going to Utah.” It was used as a hotel for riverboat travelers and was a station on the Underground Railroad. 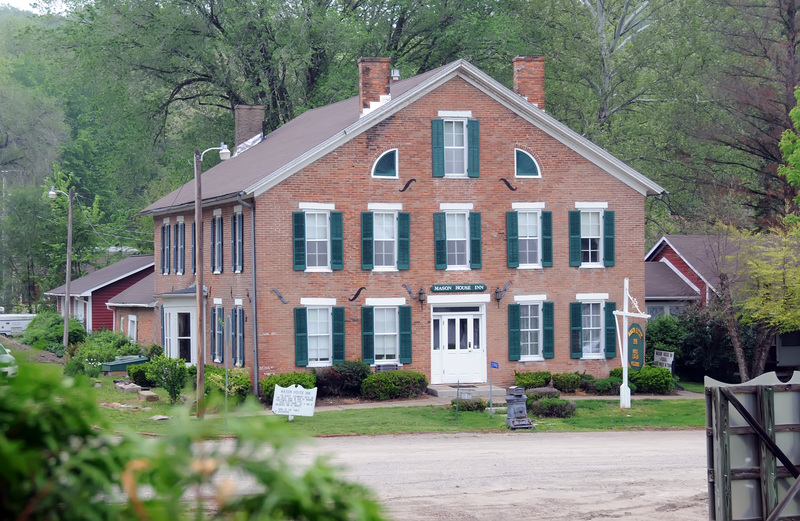 Currently, it is privately owned and used as a bed and breakfast. Its rooms are quaint and feature rustic themes of more than a century ago. 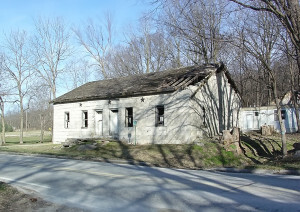 The old “Mormon House” at Bentonsport, IA. Photo by Kenneth Mays. According to tradition, this building was built by Mormon craftsmen as a two-story duplex. It may have even housed Mormon workers as a dormitory while they worked on other buildings and projects. It was subsequently used as a wagon factory and private residence before falling into a state of disrepair. 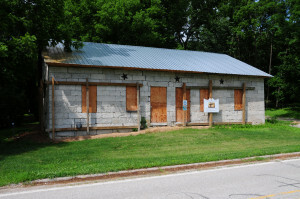 According to the sign in front, the structure is owned by the Bentonsport Improvement Association. Beginning at Fort Madison, IA on the west side of the Mississippi River, follow SR 2 west for about twenty-five miles. Turn north on CR W40 to Bonaparte and then left on CR J40. Follow that road northwest for about four miles to Bentonsport. 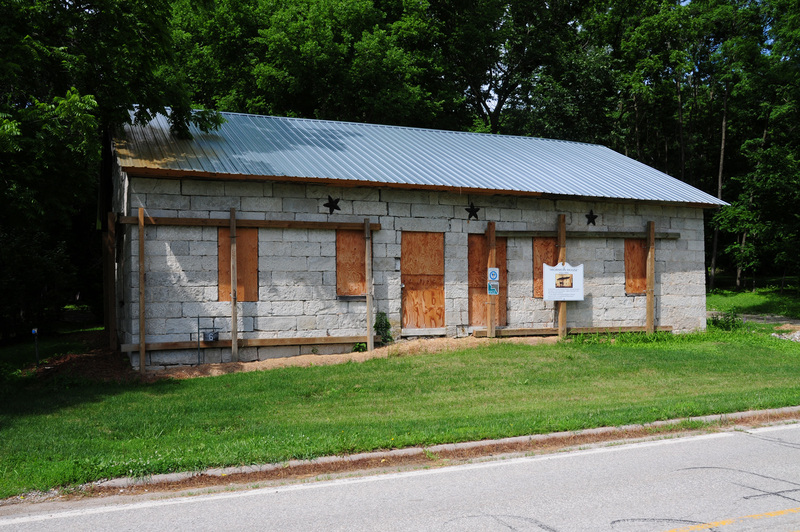 GPS: 40°43’31.84″ N; 91°51’12.64″ W.
The address of the Mormon-built Mason House Inn is 21982 Hawk Drive, Bentonsport / Keosauqua, IA 52565-8260. One-lane (now pedestrian) iron bridge over the Des Moines River at Bentonsport, Iowa. Photo by Kenneth Mays. 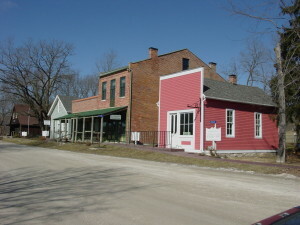 Historic village stores at Bentonsport, Iowa. Photo by Kenneth Mays. “Mormon House” at Bentonsport, IA. Photo by Kenneth Mays. 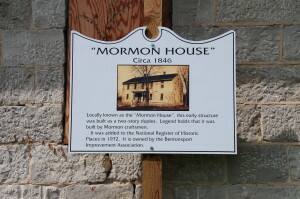 Sign interpreting the Mormon House at Bentonsport, IA. Photo by Kenneth Mays. William G. Hartley and A. Gary Anderson, in LaMar C. Berrett, ed. Sacred Places, Vol. 6 Iowa and Nebraska, 43-44.